thought I'd share it with you. When did I quit smoking? 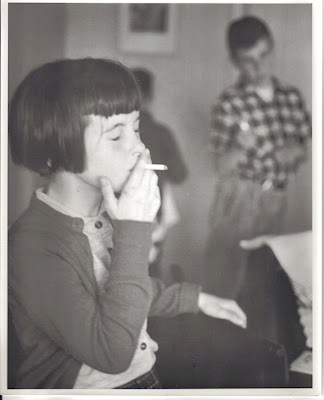 I was a little girl many people thought smoking was cool. cellophane over the box, and tin foiled paper lining. chocolate cigarettes anywhere when we moved to Toronto. Labels: smoking. chocolate cigarettes. pretending. I still love chocolate. You look so into smoking that coffin nail in this picture. Clearly, you had observed carefully the pose, attitude and facial expression of intense commitment that inhaling produces. Hope you still enjoy chocolate. I always feel sad for people that give that up. Don't worry, I kept eating chocolate long after I crumpled up my last pack of "ciggies". the milk chocolate variety -- probably not healthy. I get what you mean. It's sad that people have to give up chocolate, wine or flowers. I absolutely love this photo, it's fantastic! Mostly because of its humor, but also because I just really like old pictures of people I know (by the way, I can really see a mix of Sam and Christopher in the shot, kind of cool). just a really good photo. It tells a story. The younger kid showing off, the older brother watching and probably wanting that attention -- plus the sheer humour of it. So do I! And I remember having those chocolate cigarettes as a kid, too. Like your hair cut and the "fifties'atmosphere" - great that you posted it, Barbara! Weren't they fun -- the fake ciggies. Did you grow up to be a smoker? I think the politically correct removed them in Canada. Too bad. Kids like pretending to be naughty. I LOVED the candy cigarettes! Ours were never CHOCOLATE though, ours tasted like the white candy hearts and were that texture. There was even a little dust (powdered sugar perhaps?) that made a little "puff" when you breathed on them. Great picture, and great shared memory we all have! I think we had the candy ones too --somehow the end looked like ash. It's bizarre to think of it isn't it? I mean I can't imagine us giving these to our children today.